Name, the same. Draft round, the same. Uniform number, the same. High school drafted from, the same. There are some differences in the baseball paths carved out by James Baldwin II and his son, James Baldwin III. The elder Baldwin made a name for himself as a pitcher; the younger Baldwin is carving out his own baseball legacy as a center fielder. James Baldwin II pitched for seven different Major League clubs. An American League All-Star in 2000 with the White Sox, he made his big league debut with the Sox in 1995 and then played for the Dodgers, Mariners, Rangers, Twins, Mets and Orioles, finishing in 2005 with a 79-74 career record. He was drafted in 1990 in the fourth round out of Pinehurst High School in North Carolina. His son, James Baldwin III, was drafted in 2010 in the fourth round out of Pinehurst High School in North Carolina. Baldwin II put time in in the Midwest League in 1992, playing for Terry Francona and the South Bend White Sox. 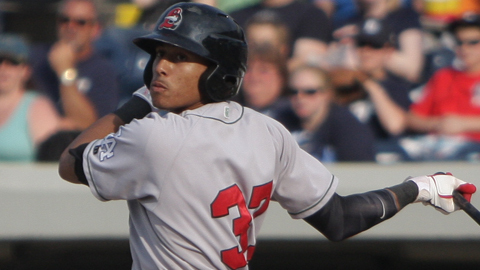 Baldwin III is in the Midwest League, playing for the Dodgers' farm team at Great Lakes. Baldwin II, who resides in North Carolina, recently played in the Bo Jackson golf outing in the Chicago area, then headed over to see his son play where he once dominated as a young pitcher. "It's a lot easier being a player than watching your son play," said Baldwin II, who watched his son belt a pair of triples and a single in Great Lakes' 8-2 victory over South Bend on Monday. "It can be nerve-wracking. I watched my son play in high school, and I was a nervous wreck. I try to be calm, but I told my wife, I see how she felt when I was pitching in front of 60,000 people. Some days you're good, and other days you're not so good, and to hear the fans and all that stuff ... it's ironic, but it's OK."
Baldwin III, a 6-foot-3, left-handed-hitting 20-year-old, had plenty of offers to play football. The Loons' speedster attracted offers from Florida and UCLA as well as home-state schools North Carolina State, North Carolina and Duke. "I'm glad I chose baseball," Baldwin III said. "I'm glad I chose this path because, as hard as [my Dad] worked, he put forth a great effort to help me play baseball, and I love the game. "My dad said he doesn't care what I do, just don't embarrass the name that I put out there. Now, I'm glad I can make my own name in baseball. Everybody looks at me like I'm James Baldwin's son, but I want people to say someday about my Dad, 'That's J.B.'s father.' But really, I'm just like everybody else. I'm out here busting my tail, trying to make it to the big leagues." Baldwin III said he's honored to play baseball in some of the same ballparks his father graced. "It's pretty cool," Baldwin III said. "A lot of places I've been to, it occurs to me that my Dad played here. That's a great feeling. It's a great opportunity to be in the same atmosphere my Dad was. People saw my Dad play here -- now they see me play here. It touches my heart. If I have a son, I'd love for him to play here." Baldwin II, who hopes to get a chance to be a pitching coach in the pros, has shared his insights with his son. Baldwin III is currently batting .217, but he's bumped up to .282 over the last 10 games. "My Dad always told me that the pro baseball lifestyle was going to be a grind," Baldwin III said. "It's going to be hard to get to the big leagues, but it's even harder to stay there. Right now, I'm struggling a little bit, but I'm getting the hang of it." Baldwin III tries to find the right balance between coaching and fatherly advice. "I try to encourage him and let him know exactly what's going on, on and off the field, but you know young people have to experience it for themselves, in order for them to grow up," Baldwin II said. "I talk to him about a pitcher's mind-set all the time. I told him, 'Whether you want to listen to me or not, I studied hitters for 17 years.' I know what to pitch them and what not to pitch them. We talk all the time, even when I'm not around. A lot of times, you don't think they're listening, but they are." Baez sidelined: Chicago Cubs shortstop prospect Javier Baez is on the bench for a few days after suffering a finger injury playing in the Peoria Chiefs' 2-1 victory against the Clinton LumberKings on Monday. Baez, listed as day-to-day, suffered the injury when he bare-handed a grounder. Ending the drought: Fort Wayne came across the right solution to end a drought of 10 consecutive games without hitting a home run -- get Lansing's Aaron Sanchez off the pitcher's mound. Sanchez, a right-hander with an ERA of 0.69, threw five scoreless innings Tuesday, allowing only two hits. After he left, the TinCaps blasted three homers and rallied for a 10-3 victory. Tyler Stubblefield ended the drought with a two-run shot in the sixth inning that tied the score at 3-3. Duanel Jones and Yeison Asencio added homers later that turned the game into a rout. Pass the mustard: West Michigan put up some impressive numbers Tuesday night, and so did the WhiteCaps' fans. West Michigan rallied for a 13-11 victory against Bowling Green. The teams combined for 24 runs and 30 hits. A total of 6,155 fans combined to eat 10,866 hot dogs on Dime Hot Dog Night. Curt Rallo is contributor to MLB.com. This story was not subject to the approval of the National Association of Professional Baseball Leagues or its clubs.